Okay #YayArea, it’s time to show those other cities what’s what. The Teaching Artists Guild has launched a tool that will be tremendously useful for all levels of arts education - if we all participate. The Teaching Artist Asset Map allows us to create profiles as individual teaching artists, arts education organizations, and arts education programs. The design is slim and uncluttered, but has room for a ton of information. This tool will help clients find arts education programs. It will help teaching artists find jobs - there is an “available for hire” button for your profile. It will help organizations find local teaching artists. So we really want to see all of our members and future members, organizations and individuals, to log in and make a profile. Well maybe in all the excitement we got a little carried away in our Facebook comments? So, we commented on a Facebook post from Teaching Artists Guild, maybe with a little bravado. 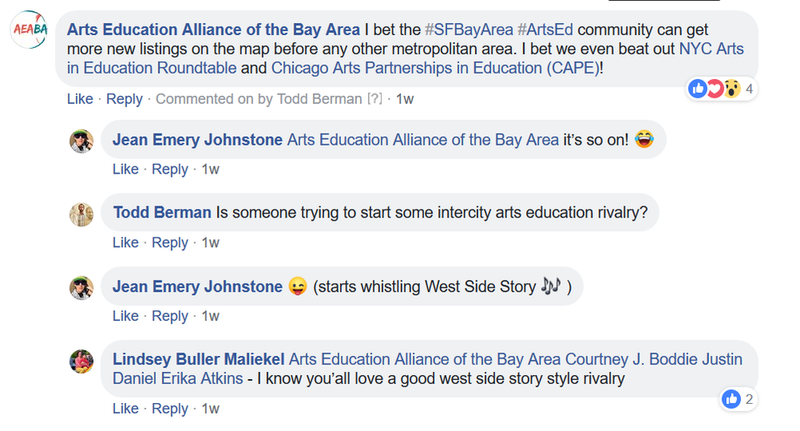 But then NYC Arts in Education Roundtable (the big apple equivalent of AEABA, except much bigger) went and threw a West Side Story GIF at us 😲! So yeah, we had to respond in kind. Right? right? So now it’s on. I’m sorry we’ve gotten you into this fight, but here we are. Will you join us in this metaphorical dance-fight brawl? We can’t solve this with a one-on-one fight, it’s going to have to be an all-in brawl. Each organization and each teaching artist needs to join the battle - which means taking 5-15 minutes to register online. Let’s have all of our organizations and programs listed on the map in time for the Arts Education Resource Fair on January 30. We have Our 2017 survey of Bay Area arts education organizations showed that we have at least 1,049 teaching artists working for local organizations. Let’s invite them all to create a profile. Bug note from Kenny: if you don’t appear on the map immediately, make an edit to your profile. That usually “wakes up the system” so your profile will be immediately visible. New features will be coming, allowing for more photos. There will also be premium features added for members (join TAG! ), such as the ability to post jobs via the map. Learn more from the webinar video below, and let’s show the rest of the country that the Bay Area has the most connected, active, awesome arts education community! TAG has developed a nation-wide map of the field of teaching artistry. It attempts to answer these questions: Where are teaching artists and organizations working? Who is being served, and how equitably? How do we find each other?